Thanksgiving is one of my favorite holidays—a chance to take a brief timeout from a career and a life that lately feels as if it’s zipping by as rapidly as a ball off the barrel of Aaron Judge’s bat. It’s a day that allows me to spend some quality time with loved ones, to truly give thanks. Before the tryptophan kicks in, please indulge me as I express my gratitude for the many blessings the world of sports has provided. People like you who have read my stuff and passed it on to others. Couldn’t have done this without you. 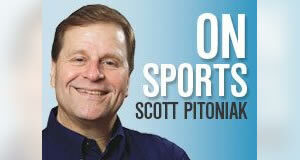 Best-selling author and nationally honored Rochester Business Journal sports columnist Scott Pitoniak will be signing copies of his various books at the Webster Barnes & Noble on December 1 from 1-3 p.m.
Good memories and comments. Well done. Really enjoyed this and all your writings. In case you don’t already know, there is a Senior Softball get-together at MacGregor’s on Buffalo Road at 1:00 on Saturday, December 1. Hope you can make it. Also, if you happen to run into Eddie Nietopski, please give him my best. Feel free to lie and tell him I’m still a decent ballplayer. Happy Thanksgiving Scott! I am thankful to have known one of the best sports writers ever in my life.